In Telemachus Stephen remembers a ghostly light playing about his mother's face as she lay dying. He thinks of it again in Proteus: "Bridebed, childbed, bed of death, ghostcandled." His thoughts in Telemachus make clear that this spectacle was a source of the nightmare that has turned his mother into a vampirish ghoul: "Her glazing eyes, staring out of death, to shake and bend my soul. On me alone. The ghostcandle to light her agony. Ghostly light on the tortured face. Her hoarse loud breath rattling in horror, all prayed on their knees." Several phrases here strongly evoke the ghost of Hamlet's father. The ghost in Hamlet glares silently on all but the young prince, singling him out from the normal run of life. It comes to inform him of the guilt of a murderous uncle and an adulterous mother, and to urge him to do something about it. To his mother, Hamlet cries, "Look you, how pale he glares! / His form and cause conjoin'd, preaching to stones, / Would make them capable" (3.4.125-27). But the ghost acts, as Horatio observes, "As if it some impartment did desire / To you alone" (1.4.58-60). Speaking to Hamlet alone, it tells a horrifying tale ("O, horrible, O, horrible, most horrible!") of King Hamlet's torturous death by poison, and implies that his tortures in Purgatory are far worse (1.5). It wants revenge on the King, it wants Hamlet to step in between his mother and her sexual partner, and it weights these awful commands with the spiritual authority associated with the afterlife. Hamlet does not know whether he can trust the supernatural spirit as the true ghost of his father, but he does feel all the weight of divine commandment: "O God!" "O my prophetic soul!" "O all you host of heaven!" Oppressed by his responsibility, and by his grief and anger, the prince becomes still more alienated from others in his world. In much the same way, the ghostly appearance of Stephen’s mother singles him out from the happiness of the living, oppressing him with a divinely sanctioned command. But in Stephen's case the ghost comes to accuse him, and to command: Repent! Pray! Kneel down! 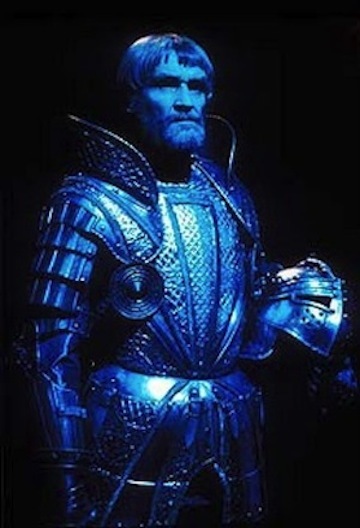 Patrick Allen as the ghost in Hamlet. Source: wviewaplitduncan.blogspot.com.